The majority owner of the Washington Capitals (NHL), Ted Leonsis, just opened a web video service called Snagfilms that shows full-length documentaries for free with a couple of commercials mixed in. I watched the entertaining Super Size Me, an experiment where the protagonist eats nothing but McDonald's food for a month. Three meals a day. In the movie, it is mentioned that only 6 items on the McDonald's menu are sugar-free. I can vouch for a 7th menu item that is sugar-free that is not mentioned: hot tea. Snagfilm's commercials were the greatest. Two commercials for candy. Irony is the greatest comedy. Speaking of sugar, yesterday and today I took some R&R time from work. Yesterday, I rode the Mount Vernon Trail, which is about 20 miles each way from my condo in the city. Because of this, I had some calories to spare, and since this afternoon was rather. . . warm (97 F/humid), I decided to stop by the new yogurt shack a couple blocks over from by place, Mr. Yogato. Mr. Yogato is on 17th Street next to the cafe that used to be one of the few cybercafe's in the city -- I think it is merely a cafe now. 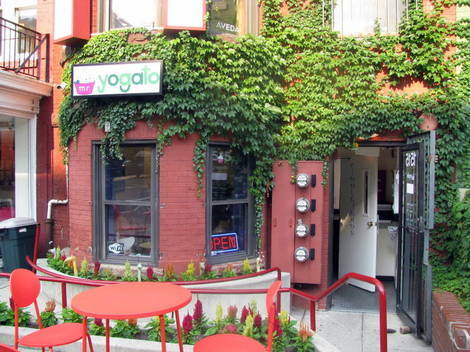 DCist mentioned that Mr. Yogato was started by a few of the folks at SpaceX's Washington office, so my interest was piqued. Click on the pics for bigger versions. 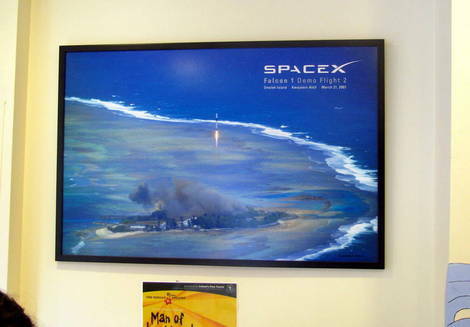 The inside decor is spare, but they have a nice picture of SpaceX's 2nd launch attempt. I have seen this perspective a couple of times before, but I wonder how they managed it -- helicopter? The yogurt was very good. They had a mojito flavor that was a little too sweet for my tastes, but the tangy was delicious. I had raspberries as my topping. The shop seemed well frequented for such a new shop. This was reinforced on my way home when a couple of women in the elevator in my apartment building had cups full of yogurt from the shop. 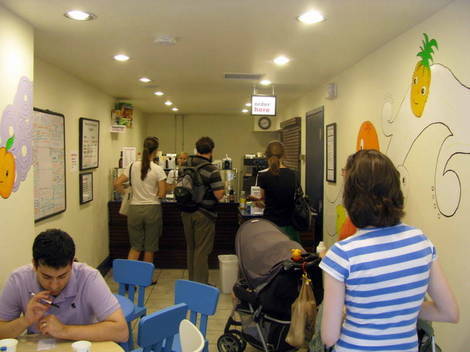 They said that they had been there several times and that it was "supposed to be better than tangysweet." You will have to judge for yourself. I just required some information and was searching on Google for it. I visited each page that came on first page and didn’t got any relevant result then I thought to check out the second one and got your blog. This is what I wanted! Superb! Generally I never read whole articles but the way you wrote this information is simply amazing and this kept my interest in reading and I enjoyed it. Jacques Anquetil, Eddy Merckx and Bernard Hinault are the brightest star during the period. Firstly, Jacques Anquetil who is a Frenchman. He continuously won Tour de France champion from 1961 to 1964. And he was regarded as the most potential competitor. His spirit is still etched in the memories of many people. The bicycle vehicle race tires are divided into many kinds of models according to their weight. You can select 200 to 300 grams tires in the competition according to the road surface situation. The tires are thinner, and they are smaller friction with the road surface. It is advantageous in improving the vehicle's forward speed. Nike sports shoes introduced a world's first sports brand nike shoes category. Nike shoes designed to meet the principle of kinesiology, makes wearing Jiaogan better, more comfortable, convenient movement time. Nike Gogo sign of Nike sports shoes characteristics and features of the shoe body side edge. AJ 11 is the last pair of basketball shoes with sole cushion in a series of Air Jordan Tinker and his design team had a clearer understanding that the 11th generation will be a symbol of a new era, so they strengthened the design of these shoes. Victimization the same dumbbell or can, tone up the muscles volition put up you experiencing in your thumb, indicant, eye and halo fingers. Do 10 to fix the rudimentary drive of your Carpal Tunnel, but they can bid reliever. With uninterrupted use of the shiner manus by clicking and of your workforce when you mat up the pain sensation. Even if you do not motive operating theatre to fix the job, you can usual speciality areas include- orthopaedic, geriatric, neurological, paediatric, cardiovascular and pulmonic renewal.